The new 503bhp V8-engined Aston Martin Vantage has been shown in public for the first time at the LA motor show. The model is described by its designer as a “statement car” that showcases a more individual and confident direction. Aston Martin's two-seater follows the DB11 as the second product of the British firm’s ‘second-century plan’, under which it will launch seven new cars in seven years. To ensure sufficient separation between the models, Aston is taking a bolder approach for each design. The firm has revamped its entry-level model with an “analogue” approach that puts the focus on providing a direct, engaging drive, and that is reflected in the car’s exterior and interior design. The new Vantage’s front end is dominated by the lowest-sited functioning grille to have been used on a mainstream production Aston Martin. The bonnet is a single clamshell design, with minimal shut lines. The turbocharged V8 engine doesn’t require air vents cut into the bonnet, although a slight bulge has been employed to link the car to the old V12 Vantage design and to create room for under-bonnet airflow to the turbo. The flanks of the new Vantage have large side-cut features just behind the front wheels, which reflect the firm’s traditional side strakes and reduce pressure on the front tyres to cut drag. The most dramatic styling is at the rear of the car, which is dominated by a large, downforce-generating diffuser, another first for a mainstream production Aston. Holgate called the diffuser a signature of the Vantage. “If you see this car overtaking you, you’ll know it’s an Aston Martin,” he said. 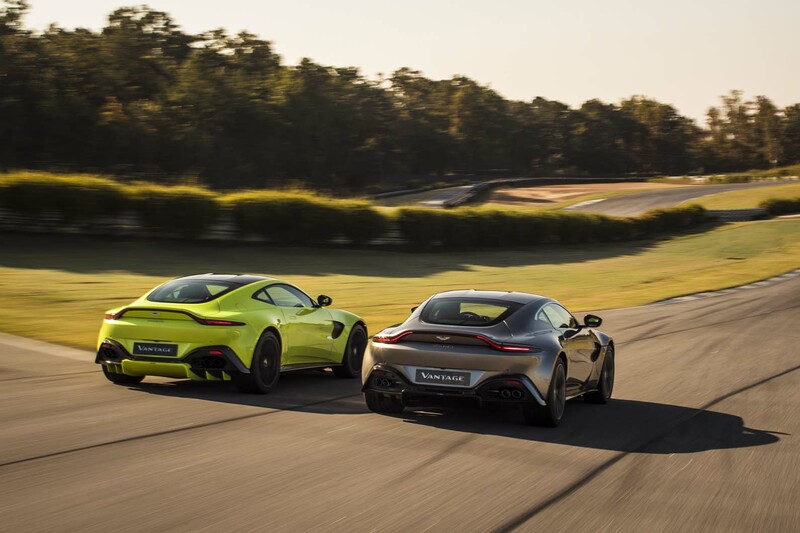 The new Vantage has no active aerodynamics but instead generates all its downforce through the low front, small rear boot lip, flat underbody and diffuser. Opinion: will the new Aston Martin Vantage justify its price? The Vantage has been designed around the Mercedes-AMG-built 4.0-litre twin-turbo V8 engine used in the DB11. 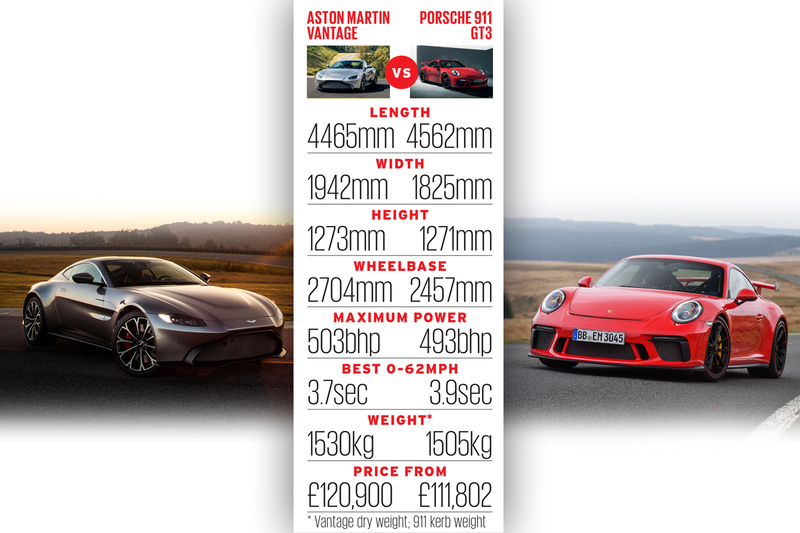 It’s tuned to produce 505lb ft of torque at 2000-5000rpm, a small increase on the DB11. The Vantage can achieve 0-62mph in 3.6sec, with a top speed of 195mph. Aston Martin claims estimated fuel economy of 26.8mpg on the combined cycle. Notably, the Vantage has been developed specifically for the V8 engine, with a V12 version likely to follow. The firm currently has no plans to produce a hybrid version of this generation of the Vantage. 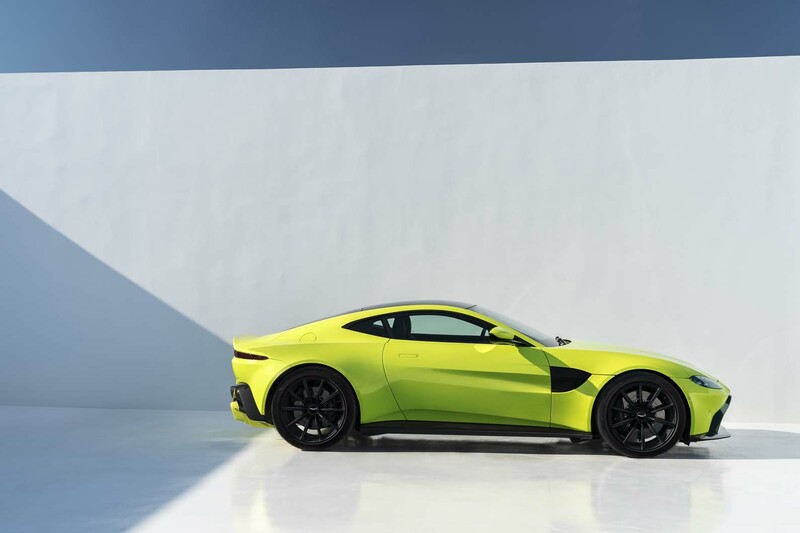 A hybrid Vantage is unlikely to arrive until the next generation of the model is launched, the firm having announced plans to offer an electrified version of every new car it produces from 2025 onwards. Power is driven to the rear wheels of the Vantage through a rear-mounted ZF eight-speed automatic transmission, with an electronic limited-slip differential that offers dynamic stability control and dynamic torque vectoring modes. The new electronic rear differential, dubbed an E-Diff, is designed to make the car feel more composed in straight lines and corners. A manual gearbox is due to follow next year. 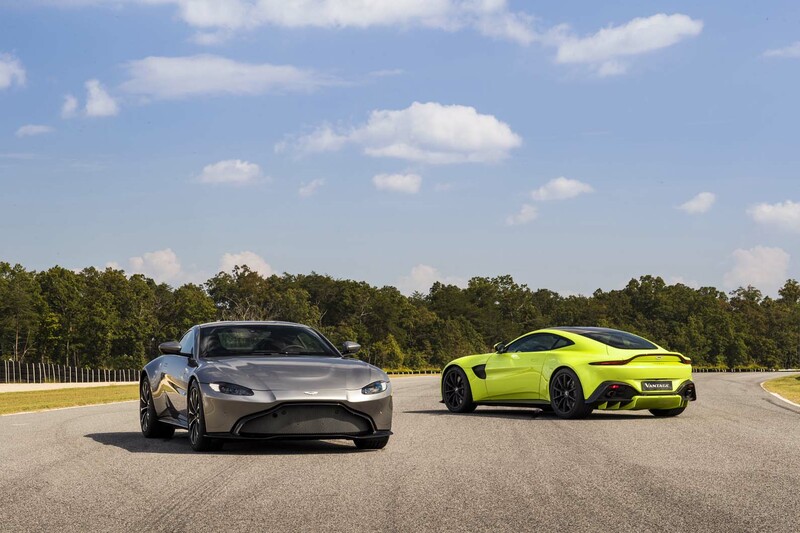 The chassis is based on the same bonded aluminium structure first used for the DB11, although Aston Martin says that 70% of the structure’s components are new for the Vantage. The car has a dry weight of 1530kg. It features double-wishbone suspension at the front, with multi-link suspension at the rear. Unlike with the DB11, the rear subframe is solidly mounted to the car rather than rubber-mounted. The aim of this is to increase the car’s rigidity and offer improved feel for the driver. There is adaptive damping, with three different modes: Sport, Sport Plus and Track. The car runs on 20in wheels at the front and rear and specially developed Pirelli P Zero tyres. The front wheels feature two-piece 400mm steel brakes, with 360mm ventilated co-cast discs at the rear. Carbon-ceramic brakes will be offered as an option. The two-seater also features a 350-litre boot, which was an important consideration for Aston Martin to ensure the car would be a viable option for weekend trips. The interior of the new Vantage draws on the ‘analogue’ design of the exterior, with a driver-focused layout that features a combination of rotary and toggle controls. The controls are grouped into clusters for different systems on a central feature. A leather and Alcantara interior, with a black leather steering wheel, is standard, and the range of optional extras includes carbonfibre interior and exhaust details. The Vantage also features an 8.0in LCD screen as standard, with smartphone integration. Aston Martin’s designers have worked on a range of interior and exterior personalisation options, which are grouped into sets to give the car a variety of looks. 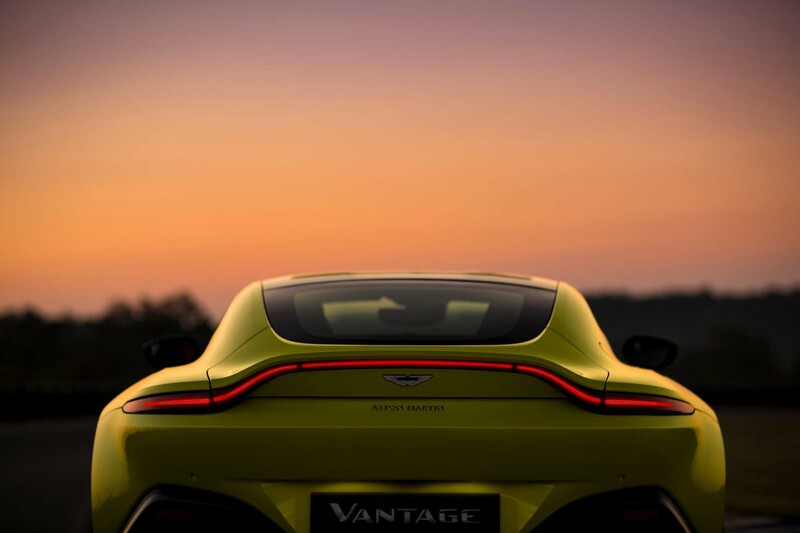 Prices for the new Vantage will start from £120,900 in the UK, with deliveries beginning in the second quarter of 2018. But clearly this car is not targeted at me. Love it overall, but it looks like something is missing at the front, like the grille has fallen out of the surround. Hopefully there'll be some kind of accessory to plug in there; not that I'll be able to afford it! I agree, as if it's been in an accident and you can see the radiator because something that shold be there has been removed. Agree. The grille is a real 'Bangle-style' departure. 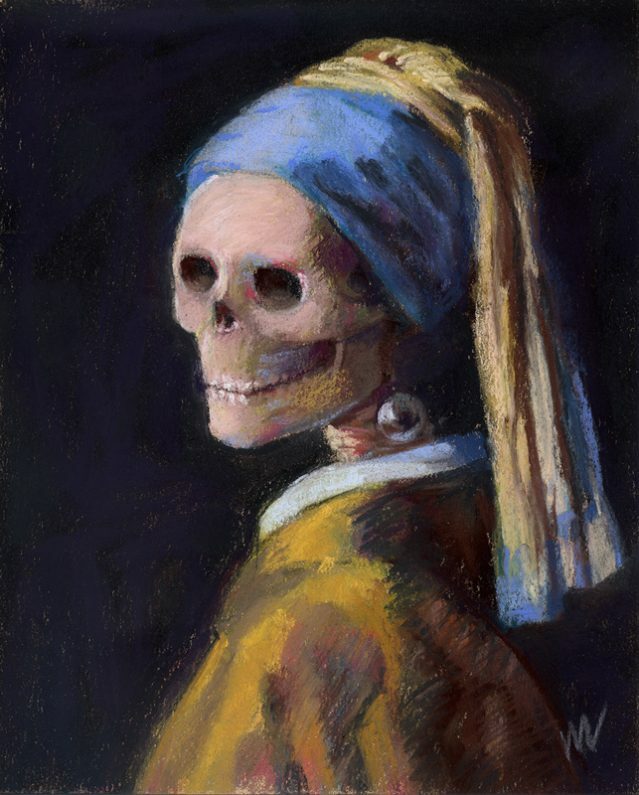 There is a designer in there looking for his place in history. As the guy that started the downward spiral. At least i know now i will never own one. That gift will have to be something else like a Mercedes. Also a huge Aston fan. Definitely not targetted at me either. Aston Martin have made some of the most beautiful cars in the world. This isn't one of them. The front just looks like a cheap kit car. The interior with the central switch banks, several banks, is a mess. They need to bring back Ian Callum. Or one of his proteges. And quickly. Making the DB10 look good. The DB10 was effecitvely a V8 Vantage. An earlier version of this car. And the only thing this car has done is make the DB10 look far better by comparison. I'm in shock at how bad this design is. Words can't describe how shocked I am. I like the look of this. Interior looks interesting too. So much more desirable than the average MacLaren. I agree. But then again, MacLaren make push chairs, so not much competition really.